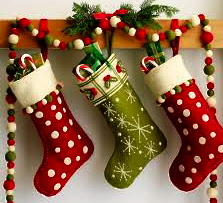 the Bear Blog: It's Time to Hang Your Stocking! We are getting geared up to bring you some special quilting treats! Tomorrow is Day One of the 12 Days of Christmas. Each day brings a new offer of fun. Debbie has been busy with the elves selecting an array of tools and notions that will be a wonderful addition to your sewing supply. it's hard to imagine what she has found for you this year! This is a great chance to shop for yourself, but how about a special friend, a dear relative, a fellow guild member? Or take mercy on some of those guys out there who really need a little guidance to shop for the quilter in their life--guide them to our website, facebook page and blog. They can pick and choose and have us put it all together in a wonderful gift bag to put under the tree. The fun starts Monday, December 3. A new gift offer is posted each day and each offer is available for that day until midnight. We will have a new offer every day for 12 days, except Sunday 12/9. You can choose to order one item or all 12, I guess it just depends on how big your stocking is! or in person in the store during regular business hours. Mon-Thurs 9-9, Fri & Sat 9-5, Sun 12-4. So get ready for some fun!